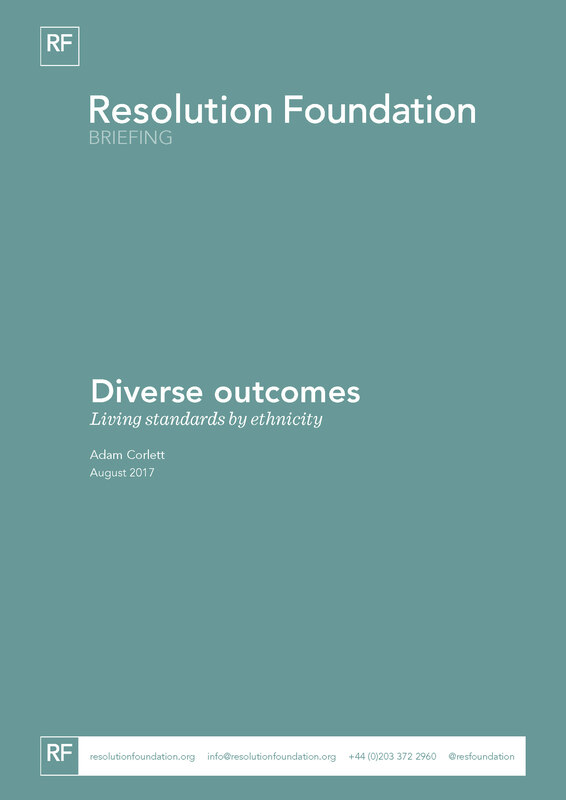 This briefing note looks at how typical household incomes have differed by ethnicity, given that around one fifth of the population self-report their ethnicity as something other than White British. While not an attempt to offer comprehensive analysis, we also explore some of the causes, including differences in the labour market, pointing to the need for further work. There are large differences in typical household incomes by ethnic group, with typical Bangladeshi household incomes being £8,900 a year (35 per cent) lower than the White British median; Pakistani households £8,700 less (34 per cent) and typical Black African households £5,600 less (22 per cent). These income gaps are wider after accounting for housing costs, given that 58 per cent of White British families (singles or couples) own their own home while only around one in four Bangladeshi, Black and Other White (primarily European) families do. After taking housing costs into account, the disposable income gap between typical White British households and Bangladeshi households increases to £9,800 (44 per cent). These large income gaps are persistent, but have narrowed. Between 2001-03 and 2014-16, typical incomes grew in real terms by 38 per cent for Bangladeshi households and 28 per cent for Pakistani households, compared to 13 per cent for the White British group. Growth for Black African households was 11 per cent. The Other White group had the lowest growth, with an 8 per cent fall in typical income after housing costs. This likely reflected compositional change, with relatively large immigration from Eastern Europe into this group. Employment differences provide part of the reason for household income differences. Employment rates for Pakistani and Bangladeshi women are 37 per cent and 31 per cent respectively, far below the White female rate (72 per cent). However, there has been a steady catch-up, with increases of 10 and 18 percentage points over the past 14 years. Black African female employment rates have also increased substantially, while the Black Caribbean female employment rate – always high – has risen too and exceeded that of Black Caribbean men for a period after the crisis. Male employment rates have also risen dramatically for ethnic minorities. Black male employment rates fell substantially post-crisis and were slow to recover, but since then have rebounded to record highs. Sustained employment growth for Bangladeshi and Pakistani men – with increases of 17 and 10 percentage points respectively since 2001-03 – has also supported household incomes, as has real growth in typical weekly earnings of 28 per cent compared to 1 per cent for other male employees. However, unemployment rates for Black, Bangladeshi and Pakistani men (at 8-12 per cent) remain higher today than was the case for White men even during the recession. Age and family size can also explain some differences in both living standards and faster income growth for some groups. Some ethnic populations are far younger than others, contributing to differences in employment, incomes, and home ownership. The Pakistani, Bangladeshi and Black African populations in particular are less likely to live in pensioner families and have higher numbers of children on average than others. The average number of children in Pakistani and Bangladeshi households has declined significantly over the past 20 years, reflected in higher equivalised incomes, while for Black African households the number of children has edged up slightly.